So what gets me anxious behind the countertop? MEAT. Not all meat; I can cook a juicy burger or Sicilian Braciole without breaking a sweat. It’s mainly meat that needs prep. You know… the butchering, to put it delicately. It makes me cringe and clam up and want to run very very fast in the other direction. I’m a wimp like that. 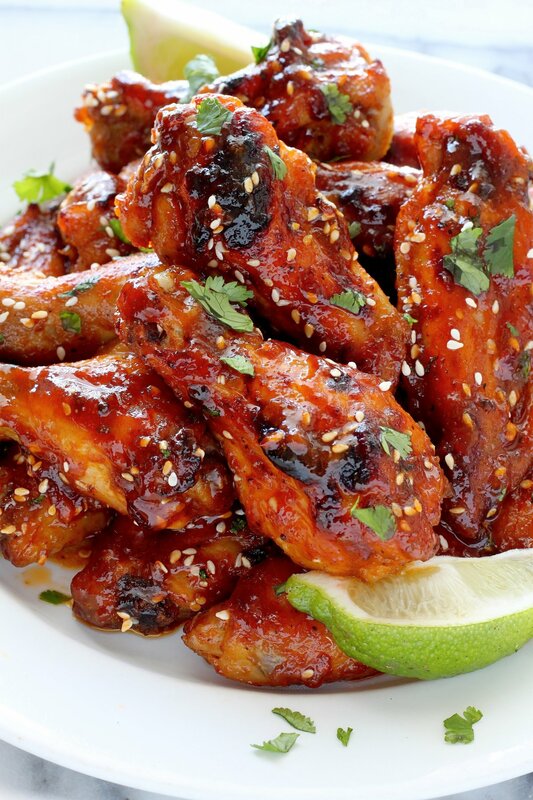 Hands-down my favorite appetizer to order when we dine out is sticky, saucy, sweet and spicy chicken wings. They’re such a treat because they’re something I never ever ever make at home. Or I should say, up until last week I never ever made at home. February was all about the chicken wing challenge! And although there were quite a few tears and a whole lot of swearing, I have to say one bite of these sweet and spicy sriracha baked chicken wings made it all worth it. Redemption is sweet. So let’s get down to details, shall we? 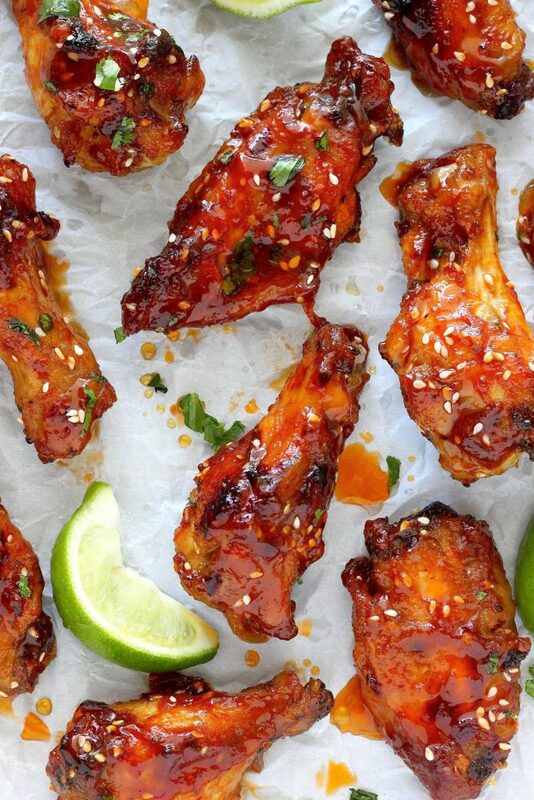 These sriracha wings are baked – not fried – so you’ll need a very large baking sheet and an oven for this adventure. The raw wings will get thoroughly patted down with paper towels (this helps remove excess moisture) before getting tossed with spices and oil. I used sesame oil here because I love the subtle Asian flavor it lends to the overall taste. You can find sesame oil in ethnic markets and most large grocery stores; it’s usually in the ethnic cooking aisle. The wings will bake for 50 minutes! I know that probably sounds like forever, but it’s worth it! I promise. And during this time you can prepare your spicy sweet sriracha sauce. 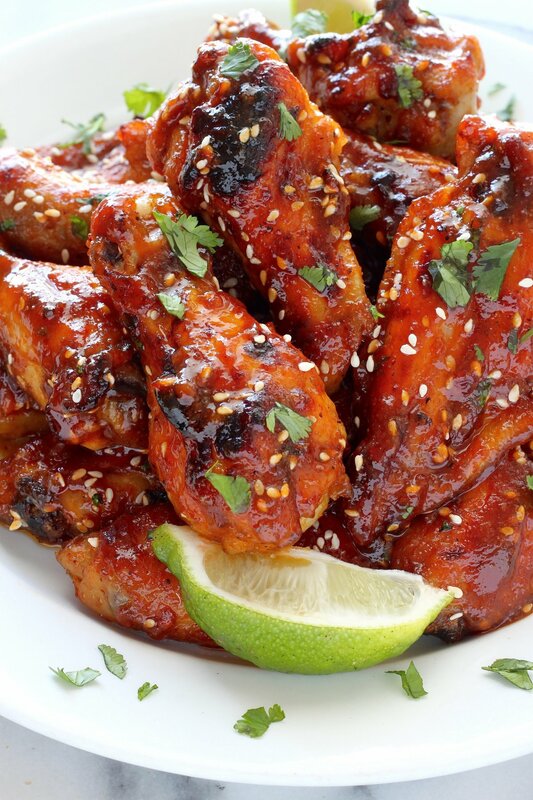 I love this sweet and spicy sriracha sauce! It’s made with sriracha, honey, butter, and spices —> ALL OF THE YUMMY THINGS. You’ll cook this combination of delicious ingredients on the stove top. 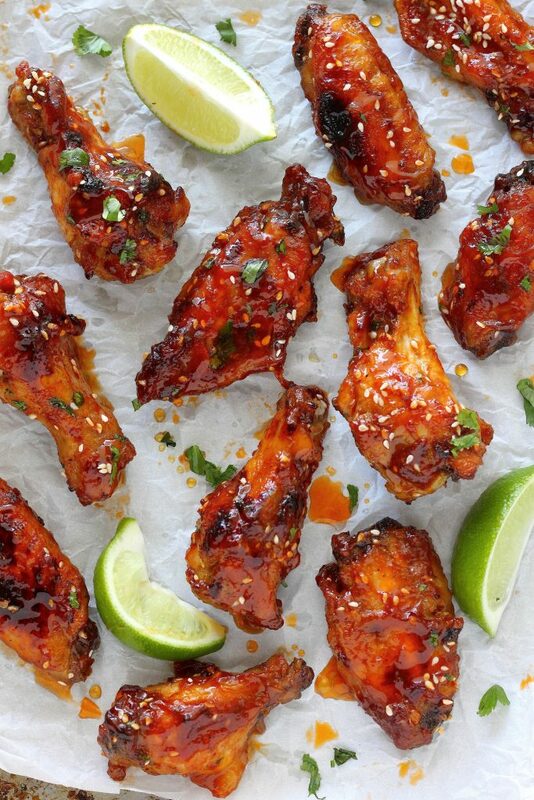 Once the wings have baked, you’ll toss them in the said sauce, crank up the broiler on your oven, and bake them for an additional 4-5 minutes. This final stage is important for crisping! 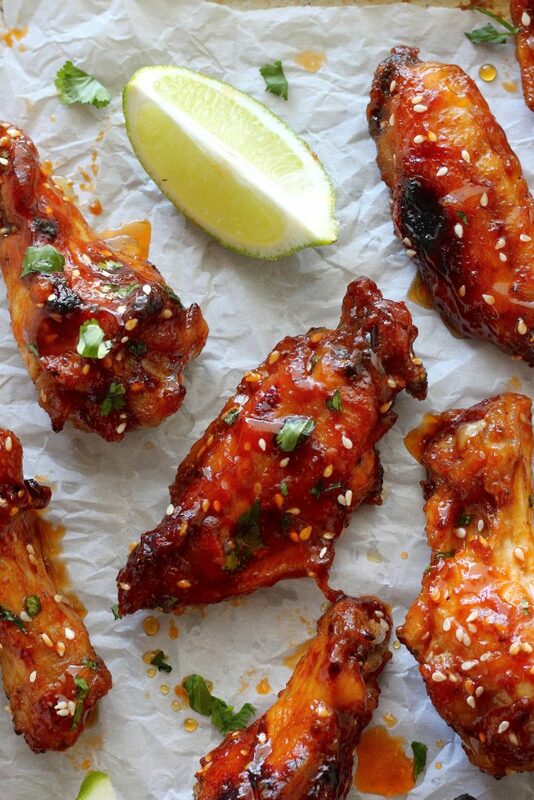 The broiling really seals the sauce into the wings and creates that crunchy skin we all know and love. These wings are spicy, crunchy, and saucy on the outside; tender, meaty, and luscious on the inside. 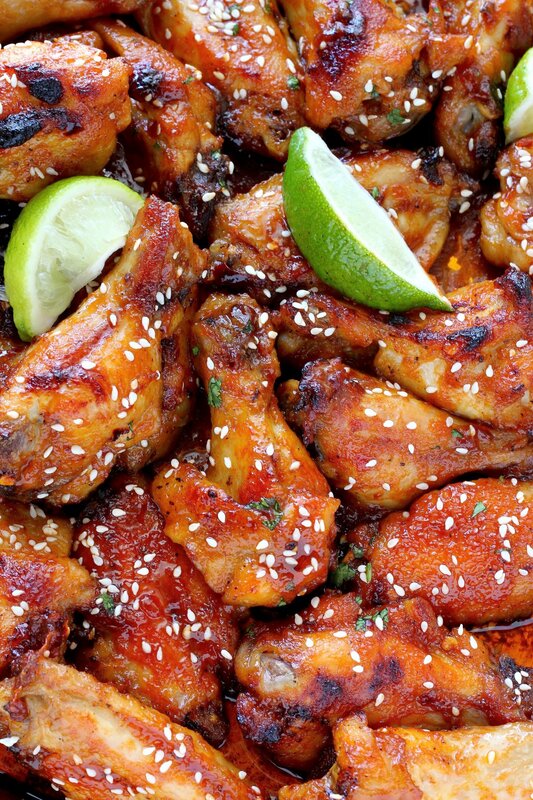 This recipe makes 3 pounds of wings; enough to serve 3-4 hungry friends. If you plan on feeding a crowd, I highly encourage you to multiply this recipe as needed. I promise you you’ll have no problem getting them to go-go-go! I made these for a bunch of boys last week and all I can say is HOLY COW – they were a huge hit! Preheat the oven to 400 degrees (F). Line a large rimmed baking sheet with parchment paper; set aside. Dry the chicken wings thoroughly with paper towels, pressing down hard to remove as much excess moisture as possible. Place the chicken wings in a large bowl; set aside. In a small bowl combine the melted butter, sesame oil, garlic powder, salt, pepper, and cayenne. Pour this mixture over the wings and using your hands, toss well to coat. Spread the wings in a single layer on the prepared baking sheet. In the meantime, make the sauce: Melt the butter in a small pot over medium heat. 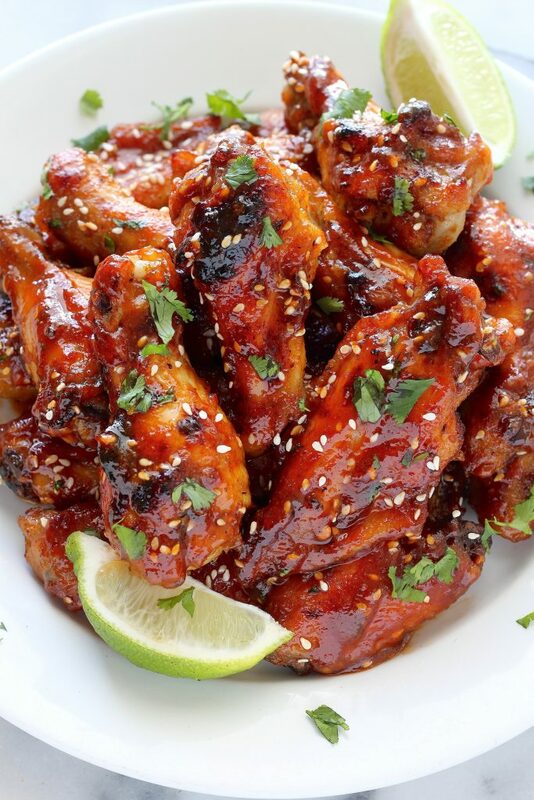 Once it's melted, add the crushed red pepper and ginger; cook for a minute, then add in the honey, Sriracha, soy sauce, lime juice, and vinegar. Bring the mixture to light boil, stirring constantly, then stir in the cornstarch; cook just until thickened up - about 30 seconds. Remove from the heat and set aside. When the wings have finished baking, carefully remove the tray from the oven and set aside. Increase the oven temperature to the broiler setting. Carefully remove the wings from the baking sheet and transfer to a large, heatproof bowl. Pour the warm sauce over the wings and gently toss to coat. Drain any excess oil from the baking sheet, then transfer the wings back to the prepared sheet and place the pan in the oven for 4-5 minutes. Stay near your oven during this time; the broiler acts fast. Carefully remove wings from the oven and transfer them to a large serving platter. Sprinkle the wings with sesame seeds, cilantro, and more honey (if desired); serve with lime wedges and lots of napkins. I made these last night and they were delicious! My whole family loved them. Thanks for the great recipe!!! This is a keeper recipe! Loved them! Definitely pinning these babies! They look incred! They look very addictive! The sauce sounds just fantastic! We’re the opposite, savory foods are totally my comfort zone, when I break out the baking utensils I have to prepare myself for the worst…I’d say you should get out of your comfort zone more often, because these wings look RIDICULOUS!! I’m totally making these tonight! I’ll be sure to come back and let you know how they turned out. These look so good – totally out of my comfort zone and I can’t wait to try them! This turned out absolutely stunning. 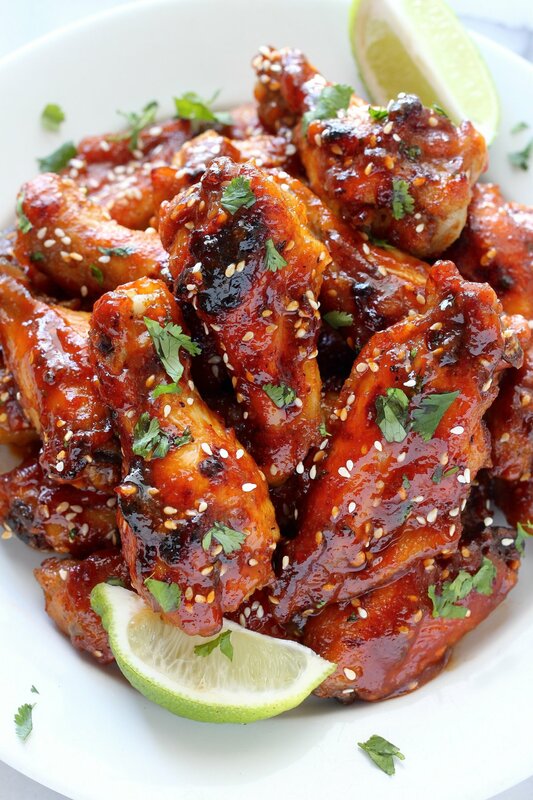 I’ve tried several other baked chicken wing recipes, but this one is my favorite. I think broiling the wings at the end added that extra crunch. Thanks so much for sharing this awesome recipe! I made these the other night and they were absolutely delicious! My partner is out buying more wings to bake right now, he loved them so much. Thank you for sharing this fabulous recipe. It will be one that is made over and over again. These look amazing! I want to make them for a party. Would it be ok for me to bake them the day before and toss them in sauce and broil the night of? Thank you! I’ll let you know how they turn out. These wings are the best I’ve ever had or made. Thank you for this wonderful recipe! I made them for a party and they were devoured in minutes. That is so awesome, Cindy! Thank you for letting me know 🙂 I need to make a batch of these soon. I made these last night!!! I didn’t think I could do it, but they turned out phenomenal!! We will make them again! Broiling them at the end really does the trick! Yay! Go Jenny 🙂 So happy you went through with the recipe and enjoyed it!!! Heather! This comment just made my night 🙂 Thank you so much for making this recipe and letting me know how much you and your hubby are enjoying it. Happy New Year! Wow!! I’d never made wings before, but I certainly will be more often from here out! These were delicious! I did adapt the recipe slightly to make it more paleo-friendly (swap cornstarch for arrowroot powder and soy for liquid aminos). Thanks for sharing! Making these for the second time tonight (super bowl Sunday). We LOVE them! Best wings ever and from our own home. Nothing will compare when we dine out. Daughter & husband snobby NYC eaters also tried the recipe and love them. I shared on Facebook last time I made them. Will try to do Instagram tonight. Thank you so much for a great recipe! Cindy, this comment made my day! I lived in Manhattan for 6 years, so I totally know what you mean when you say “snobby NYC eaters” haha 🙂 Thank you for letting me know how much you and your family enjoy this recipe. 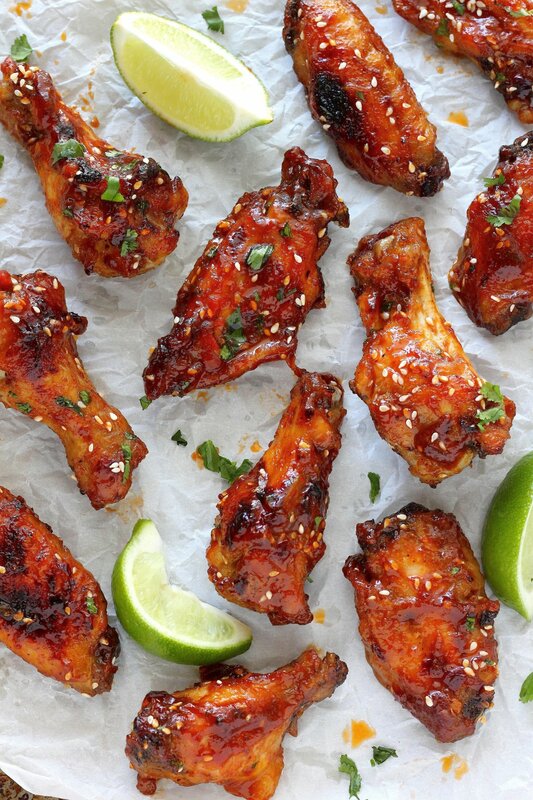 I made these, along with another wing recipe, for Super Bowl Sunday. The only thing I did differently was to boil the wings first for 15 minutes in a mix of water, vinegar, salt, and herbs. This allowed me to cut the baking time down to 20 minutes. These wings were everyone’s favorite! 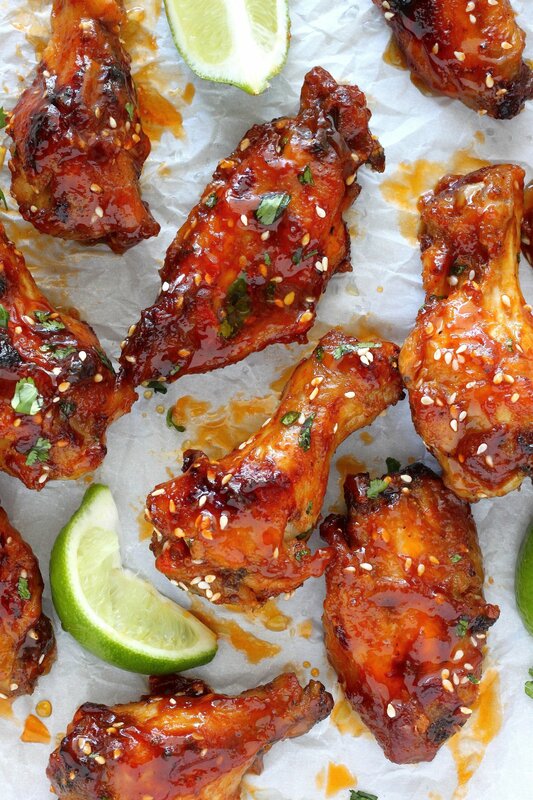 Spicy, sweet, crispy, and so tender. Thank you for a great recipe! Oh Mah Gawd. These were so absolutely delicious!!!! Crispy and sticky. Perfectly spicy and perfectly sweet with a whole lot of savory. My 2 and 3 year old left nothing but bone. I loved this recipe so much that I hand wrote it in my recipe book. These will definitely be a monthly staple in the Elkins home. I did, however substitute honey with brown sugar, and they came out superb. Thanks so much for this recipe! So happy to hear it, Hayley! I love these wings too, so it makes my day hearing how much you – and your toddlers – enjoyed them 🙂 I will have to try it with honey soon. Made these for a party. They were delicious. My husband usually doesn’t care for wings but really loved these. I AM MAKING THESE NOW AS I’M TYPING. THEY LOOK SO YUMMY. GONNA PAIR THEM WITH SEASONED POTATO WEDGES. Good lord I just made these and they were phenomenal. I used drumsticks. There are two left, for someone else’s dinner, and I am sitting here trying not to devour them. Going to make again ASAP with wings this time. I this and the sauce tasted great but it was really soupy. I kept adding more and more cornstarch but nothing happened. Any suggestions on how to solve this problem? are these to be served hot or room temp? want to take them to a function where I won’t have access to oven. Made these for dinner! Turned out awesome this recipe is delicious! I made these tonight and my son LOVED them. I will be making these again. Fabulous! We ate them all. Sauce is awesome.This will become a stapleas in my kitchen. Thanks for a great recipe. I just made these wings last night for a group of friends and I received the comment, “That is the best wing sauce I’ve ever had”. Will be putting these in the regular rotation for grilling this summer. Thanks! Great recipe!. Has anyone made these a day ahead of time? Heading to the lake and thought I could make them prior to going and maybe just heating up? Did anyone reply to you, or did you try it? I’m making a large batch for a party tonight. I was thinking of making these earlier today, refrigerate, and then take them out to cool down a little and do the final step of sauce and broil?? Recipe was great! I use boneless skinless chicken thighs, added for cloves of chopped garlic and some citrus Ponsou sauce. Sprinkle flaxseeds and cilantro instead of sesame seeds. these look great. I’m making a large batch for a party tonight. Do you think I can make these earlier today, refrigerate, and then take them out to cool down a little and do the final step of sauce and broil?? or should I do it all in one step?? Hi Kelli. I think that should be fine! Just came across this recipe today and made these for a football snack! BEYOND delicious! My boyfriend was in heaven. Broiling really is a nice touch!! Hello, I’m excited to make these wings! One question, I’m not real keen on sesame seed oil. Can I substitute? Oh and can I boil the wings? Hi. 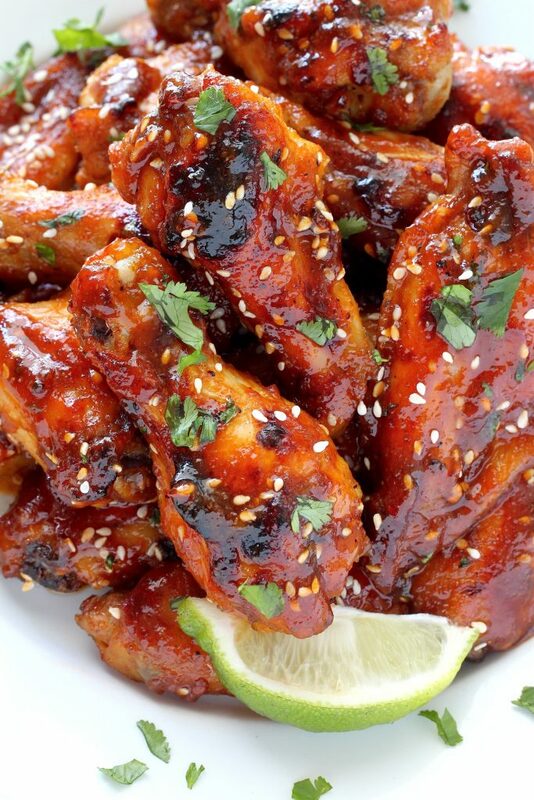 Just made your wings for super bowl. Absolutely best wings we have ever eaten. Me and my husband have no words!!! Exceptional sauce!! Perfect blend of spices and heat. My husband says best wings ever! Thank you for this keeper!! These are Fantastic!! My favorite wing recipe. I make them often. Sometimes I just do the first round of spice and don’t add the sauce. That’s great too. But i do love that sauce. Thanks for sharing! These were outstanding! I just made them for a second time. My husband and two sons are avid chicken wing eaters and this made them very happy. They thought these were just as good or better than the popular wing restaurants. Thank you!! It was amazing! Will definitely be making this again! These were delicious! It’s sweet and a little spicy going in and a nice little kick at the end. Great flavor! I made these wings for dinner this evening and we devoured them!!! My husband, son and I loved them and I will definitely be making them again!1 Thank you for an awesome recipe!! Can you use this with drumsticks? If so, what would the cooking time be? My family loves this recipe! We have a full day planned with guests coming up so I was hoping to make something they’d love but can just pop in the oven and have ready ahead of time. What are your thoughts on making the sauce a head of time and pouring over the raw chicken and letting it sit in the sauce for 24 hours?